LIKE so many other shipbuilding establishments on the Clyde, John Brown & Company began as an engineering shop, for in its early days the River Clyde was even more famous for its marine engines than it was for its ships: a number of hulls built in other centres were installed with engines from the Clyde. The present firm of John Brown & Co. is a combination of John Brown’s steel interests from Sheffield and J. & G. Thomson’s shipbuilding and engineering works on the Clyde. John Brown’s is the older, having started his steel works in the early part of the nineteenth century. For a long time he was in a small way of business, although recognized as one of the most brilliant men in the industry. In 1854 he laid the foundations of his fortune by acquiring the Queen’s Steelworks, which he renamed the Atlas Works. At that time they were valued at £14,050; fifty years later £2,500,000 was a very conservative valuation. These works permitted him to lead the industry when the world became interested in ironclads through the operations of the first armour-plated Kinburn batteries in the Crimean War; he greatly improved the process of the manufacture and efficiency of armour. For this he was knighted in 1867; he retired very soon afterwards. James and George Thomson started in 1846 as engineers in Glasgow and soon made a reputation for reliable work. They added shipbuilding to their business in 1851, soon after the Cromwellian Navigation Acts had been repealed, when British shipowners were looking for the best and most efficient new tonnage to enable them to overcome free foreign competition. At first Thomson’s went in for comparatively small craft only and had a small yard close to Glasgow. ships were going to get bigger and bigger, and they wanted a permanent site. Thomson’s could not, however, have foreseen the extraordinary growth in the size of ships which was to make their yard world-famous, because it was situated opposite a small river - the Cart - which gave them added water into which the ships could be launched. For nearly ten years after their Clydebank yard was established, Thomson’s kept their engineering side at the foundry at Finnieston, Glasgow; but this meant dividing their operations, and finally they decided to concentrate all their activities in the one yard. The engineering works were, therefore, taken down to Clydebank, where, within a short time the firm had occupied an area of 35 acres. They had eight building slips - of which the largest were big enough to tackle the biggest ship then imagined - and normally employed over 4,000 men. THE ROUTE TO THE SEA taken by all the ships launched from John Brown’s Yard at Clydebank is illustrated by the map above and the photograph below. The map shows the route from the River Cart, and the photograph gives a more general view of the Clyde and of John Brown’s Yard above the Cart, which, in the photograph can be seen, left centre. The map was specially drawn for the sailing of the Queen Mary from the Clyde to Southampton in March 1936, and shows the great skill required to navigate her even after the Clyde had in places been widened. Difficulties faced the pilots from the outset, for it was necessary to ease the Queen Mary foot by foot into the River Cart, opposite the fitting-out basin, and then get her back into the Clyde. Some of the world’s most famous ships have been built by John Brown and have passed down this narrow strip of water to the sea. These ships have included such great ocean-going liners as the Lusitania (30,000 gross tons), the Aquitania (45,000 gross tons), the Empress of Britain (42,000 gross tons), and such famous battleships as H.M.S. Barham (31 000 displacement tons), H.M.S. Repulse (32,000 displacement tons), and H.M.S. Hood (42,000 displacement tons). By that time they had already built a number of excellent vessels and had been closely associated with the Cunard Company, for which they built such ships as the Bothnia (4,535 tons) of 1874 and Gallia (4,809 tons) of 1879. At that time, however, the Cunard had for some years lost their interest in the Atlantic Blue Riband, and it was on the Cape trade, with the Union Liner Moor, that Thomson’s first came into real prominence for speed. Their first Blue Riband was gained with the National Liner America. She was laid down in 1883, a beautiful clipper-stemmed steamer of 5,528 tons which won the record in 1884. Thomson’s had done all that they were asked to do; it was not their fault that her owners attempted to run a single ship service and, like other owners who have tried to do that, very nearly ruined themselves over it. She became an Italian cruiser and it is a tribute to her builders that she was in commission as the Italian Royal Yacht after the war of 1914-1918. The America had shown what Thomson’s could do with this type of vessel, and towards the end of the ‘eighties, when the British Government was willing to support the construction of bigger and faster Atlantic liners to have them as a reserve of cruisers in wartime, the Inman Line went to them for the City of New York and the City of Paris. These were ships of 10,500 tons apiece, designed as rivals to the White Star Teutonic and Majestic, of approximately the same size and speed. The competition between these four ships was intensely keen and took the speed of the Atlantic record to over twenty knots for the first time; but in the early ‘nineties the American shareholders in the Inman Line secured the transfer of the company to America as the American Line, and the City of New York and the City of Paris became the New York and Philadelphia, famous in war and peace. They were not only record breakers but they were also well-built and reliable. This last was the principal consideration in getting the firm put on the Admiralty list in the mid-’nineties for the construction of the biggest battleships then considered. So successful were Thomson’s with these that orders came from the Japanese Navy as well as from the British. In 1899 John Brown & Co. of Sheffield were looking out for a shipyard to combine with their steel business and chose that of J. & G. Thomson after having examined almost every establishment that was likely to be sold for the very good price that they were willing to offer. John Brown’s were not only pleased with the organization and reputation of the firm, but also they saw the possibilities of indefinite expansion and were looking well ahead on the naval and mercantile sides. The change of ownership made no difference to the yard’s policy, except that it gave it bigger resources for expansion. The Cunard Saxonia (14,281 tons) of 1900 was designed for the greatest comfort and had a splendid reputation for steadiness. She was followed, among many other ships, by the Cunarders Carmania and Caronia of 1905 - “The Pretty Sisters” - which were of over 20,000 tons each and which, while they did not aspire to high speed, were of tie greatest interest technically, as the Carmania was the first New York liner to be fitted with turbine engines, and led the way directly to the construction of the Lusitania. When the Government decided to assist the Cunard Line in the building of the 25-knot Lusitania and Mauretania, each with a gross tonnage of over 30,000, there were not many ship-builders who were willing to take such a risk and to spend the money that was necessary for their safe construction. John Brown’s had the contract for the Lusitania, and to permit her launch expensive dredging operations were also necessary. The ship was an unqualified success, recapturing the Blue Riband after it had been held by the Germans for ten years, and was a great popular favourite until she was sunk by a torpedo on May 7, 1915. At almost the same time as they built the Lusitania John Brown’s also built the pioneer battle cruiser Inflexible, and she did so well that they were given the contract for the battle cruiser Tiger shortly before the war. These were in addition to many other men-of-war of all types and some noteworthy merchantmen. In 1914 the Cunard Company wanted a third ship to supplement the Lusitania and Mauretania, but for her they had no Government assistance and thus they had to design her entirely as a commercial proposition. This ship was the Aquitania, and her speed was, therefore, slightly less than that of her two consorts, and her gross tonnage had to be increased to over 45,000, so that her cargo and passenger accommodation should be increased. Like the Lusitania, she was a ship with a very definite personality, such as the Clydesiders dearly love, and on service she has proved a popular and profitable ship. On the naval side John Brown built the battleship Barham, of the Queen Elizabeth type, and the battle cruisers Repulse and Hood, the 42,000-ton displacement of the last-named making her the biggest capital ship in the world, especially exempted from the limitations of the Washington Conference. Since the war of 1914-1918 John Brown’s have built a large number of liners of all types and sizes, both steam and motor, and have fully maintained their reputation. 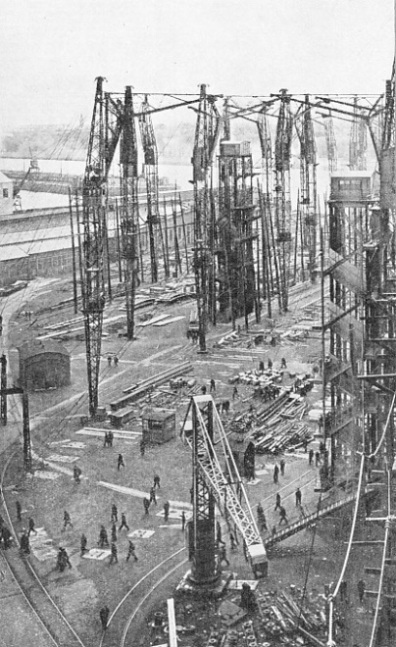 When the Cunard Company, as it was then, approached the ship-builders for the construction of the Queen Mary in 1930, John Brown’s were one of the very few yards in the country capable of tackling such a colossal task, and the price that they quoted was well below that of rival concerns. Also, they were willing to contract for the whole ship; some of the other builders fought shy of such huge commitments, so that John Brown’s got the order and proceeded with the construction of the ship. In the meantime they built the Canadian Pacific Empress of Britain (42,348 tons), which holds the Canadian record and which is one of the most noteworthy ships under the British flag. A large part of the success of the yard is due to the great care which has been devoted to the lay-out of the whole establishment. The principle of its design was that it should be able to do the maximum amount of work on any contract, buying only certain special items from outside sources; the greatest attention was paid to the hoisting and transport facilities which were so arranged that there could be a steady and absolutely continuous stream of material from the sidings to the building slips and fitting-out berths. A VIEW OF JOHN BROWN’S YARD taken during the building of the Queen Mary. The ropes in the right foreground and the lift just beyond are alongside the famous Cunard White Star liner. 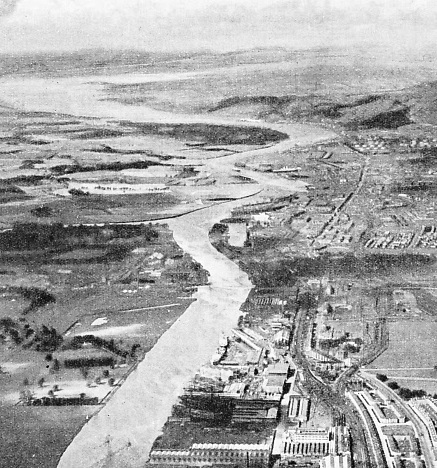 The Yard is situated on the North bank of the Clyde and is divided into two yards, the East and the West, by the fitting-out basin. It has a total area of some eighty acres, of which about half is occupied by the building slips and the yard shops. The slipway in the East or Main Yard, on which the Queen Mary was built, had to be extended to take her full length in safety. The foundations were reinforced far more than seemed to be necessary, but the company’s wisdom in going to this expense was fully justified when work on the ship was suspended in 1931. It was generally believed that she had sunk considerably during the suspension, but she was not distorted by one inch. The advantage of the steady supply in a big contract, especially when it has to be carried out against time, is obvious, but the company also gained immensely by supplying so much of its own material; it has not only proved economical but it also avoids the risk of items being delivered out of their time and so checking the smooth progress of the work. The company not only owns various steel firms, but also has a controlling interest in the Dalton Main Collieries Ltd, with a big coal production; yet so carefully has the yard been built up, and so conservative has been the finance of its owners, that the yard and the engineering works stand in the company’s books at not much more than the purchase price in 1899, although they have been improved out of all recognition, can tackle very much bigger jobs and have an infinitely wider range of activity. The Yard is situated on the North Bank of the Clyde, and is divided into two yards, the East and the West, by the fitting-out basin. It has a total area of about eighty acres, of which approximately half is occupied by the building slips and the yard shops, a quarter by the engineering shops, and the rest by the offices and the large spaces which are necessary for the convenient storage of material in such a way that there is no interruption to its passage to the slips. millions of cubic yards of earth were removed for the purpose. The foundations were reinforced far more than appeared to be really necessary, so that there should be no chance of their failing under the enormous weight that was put on the slip. How wise the company was in going to this expense was shown when the construction of the ship was held up for many months. It was quite generally believed that she had sunk considerably, as she might be expected to do in such circumstances, but she was not distorted by one inch, and this aspect has impressed technicians abroad more, perhaps, than any other. The yard has a frontage on to the River Clyde of over 1,000 yards, situated on the North Bank of the river directly opposite the point at which the tributary Cart runs into it. This offers additional water for the launch of an exceptionally large ship, and when the Queen Mary was to come off the slip, the tributary was dredged considerably to ensure absolute safety. The building slips, with their elaborate equipment, are backed by numerous shops of all kinds, and the firm is one of the very few private concerns in Great Britain to maintain its own experimental tank. This was installed in 1903, is carefully placed to obtain the maximum results, and has wet and dry docks at either end for trimming the models. The elaborate plant necessary for making the wax models to the required precision is grouped round the docks; the towing carriage and all necessary auxiliaries are electrically driven. This tank is 400 feet long by 20 feet wide, and in it sixteen models of the Queen Mary made over 4,000 trials. The engineering shops are conveniently placed in a central position on the North side of the works, at the head of the fitting-out basin which divides them into two. The machine shops cover an area of about 70,000 square feet, and are equipped with the most modern plant for all classes of work. THE WORLD’S LARGEST BATTLE CRUISER, H.M.S. Hood, was built by John Brown & Co, at Clydebank. She was begun on September 1, 1916, launched on August 22, 1918, and completed on March 5, 1920. She has a displacement tonnage of 42,000, an overall length of 860 ft 7-in, a beam (to outside of bulges) of 105 ft 2½-in, and a maximum draught of 31½ feet. H.M.S. Hood has a complement of 1,341 and cost about £6,000,000 - or £145 per ton - to build. The photogravure supplement accompanying this article can be seen here. You can read more on R.M.S. Queen Mary - Super-liner and The Queen Mary’s Engines on this website. 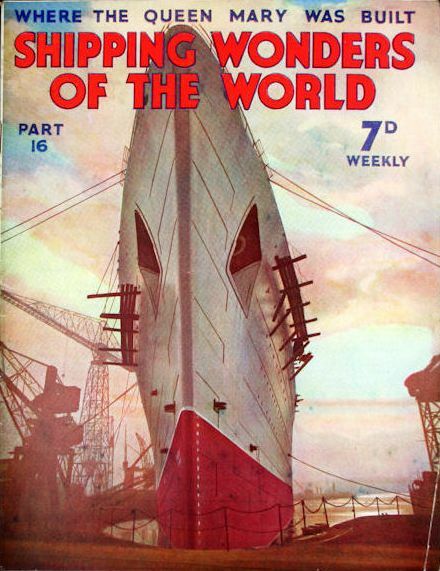 This week’s cover shows the Cunard White Star R.M.S. 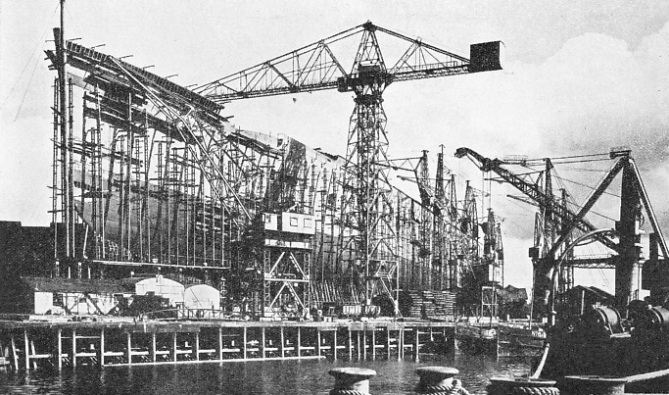 Queen Mary in the early days of her construction when she was in the fitting-out basin at John Brown’s Yard at Clydebank.